Permanent Sites Now Available! Call now for details. Act Now Spaces are limited. Enjoy Your Winter Without The Snow! Bring family, friends and pets to our sunny wonderland. Take advantage of the Goethe State Forest across the street with beautiful snow free trails great for hiking, biking and of course trail riding. Premier RV and Horse Camping. Located near Greater Ocala known for the country charm, horse farms, and truly unique local attractions. The place where you can still unwind, breathe in some fresh country air, and get back to nature. The owner, Lorel, has lived in Ohio, Wisconsin and different parts of Florida, but when she discovered this property in Dunnellon, 18 years ago she fell in love with it, and purchased it immediately. One day admiring the beauty of this land, she decided that she needed to share it with others. She designed the campground herself. Her own dream creation to share this rare find, with you. It took over 2 years for the campground to be completed in 2007. Our RV Campground is a true resort with a full compliment of vacation amenities for you and you horse. Fun in the sun for all ages and many things to do at the campground and nearby area attractions, such as Dunnellon, Williston, Ocala, Crystal River, Homosassa and Gainesville. Rainbow River Springs, spring fed river with crystal clear water, fishing and diving. Ocala water park, Florida Theme Parks, Golfing, Museums, Swimming with the manatees...and the list goes on. Check out our ATTRACTIONS page for more information. 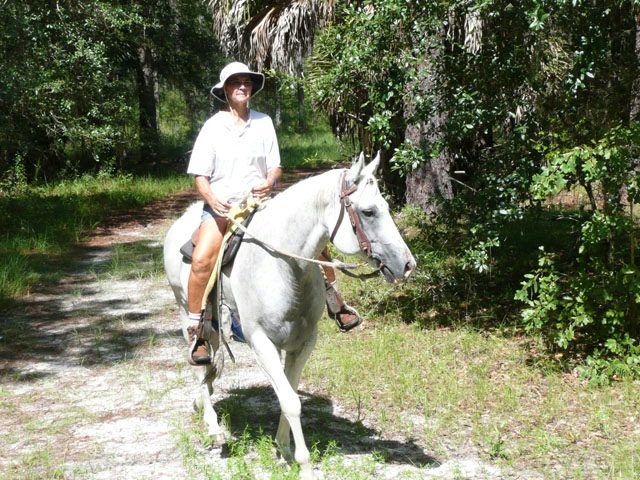 Bring YOUR HORSES along on your camping adventure to this central Florida Campground. Just kick back and forget the rat race as you enjoy quiet, country living. All your necessities of every day life can be met in the historic town of Dunnellon or the Greater Ocala area. Most of your wants can be met with only a 15-30 minute relaxing, country drive.